Should the U.S. Subsidize Fossil Fuel Companies? The world needs a reliable supply of energy. To ensure that, many countries have granted subsidies and tax breaks to fossil fuel companies to help develop energy resources. However, with the concern over our carbon emissions and over the economic crises that many countries are facing, the wisdom of continuing those subsidies needs to be examined. The fossil fuel companies are now quite profitable. 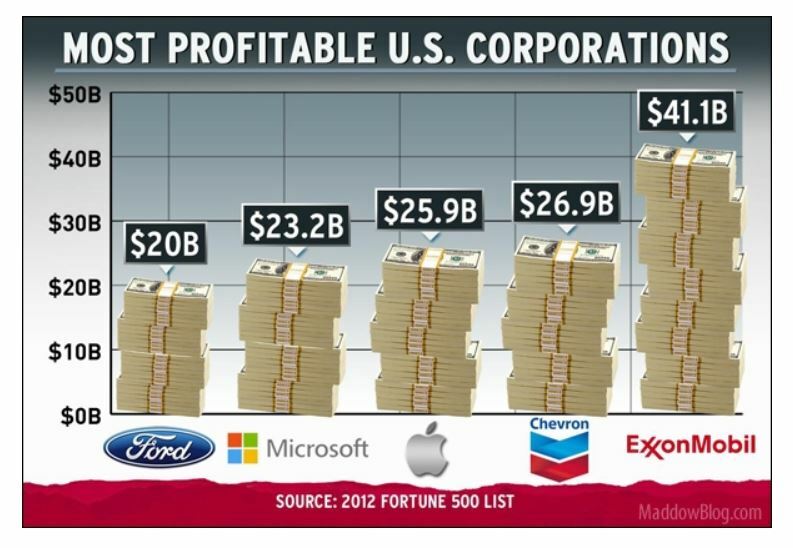 As the chart below shows, two of the five most profitable companies in the U.S. are oil companies with Exxon Mobil greatly exceeding the profitability of the other four. resilience to climate change and mitigate their greenhouse gas emissions, including those from deforestation. The United States’ yearly subsidies to the fossil fuel industries amounts to about $13.6 billion. As Washington struggles to balance the U.S. budget, that is certainly one of the cuts that should be considered. The Institute for Policy Integrity lists the number of laws giving tax breaks to energy companies. It lists 38 for the fossil fuel industries, 25 for all the renewable energy sources together , and one break for nuclear power. While it is the national interest to subsidize the development of sustainable energy resources, a much larger share of tax breaks go to well established and profitable fossil fuel companies. But that’s not the whole story. Some of the tax breaks and subsidies meant to promote the development of renewable energy sources end up with the fossil fuel companies. For example, the Georgia Pacific paper company, a subsidiary of Koch oil, mixes a byproduct of paper production, called black liquor, with diesel to make a product they claim as a biofuel. This fuel cannot be used in transportation, and can only be burned as fuel in their plants. However, Koch has managed to qualify the black liquor mixture to take advantage of the biomass fuel assistance program and has received $5 billion in subsidies for the process. Though Koch is on the record as being against green energy, funds meant for green energy projects are subsidizing the fuel for Koch’s paper mills. Congress tried to close this loophole, but the effort was ultimately defeated. The fossil fuel companies have become so large and so adept at lobbying, that they often distort U.S. policies for their own benefit. For instance, Exxon pays a lower tax rate than the average American. Between 2008-2010, Exxon Mobil registered an average 17.6 percent federal effective corporate tax rate, while the average American paid a higher rate of 20.4 percent. In spite of that, the company complains about its high taxation and is currently running ads against the Obama administration’s efforts to cut $36 billion in tax loopholes and subsidies to help balance the budget. Large oil companies are now multinational companies which have little allegiance to the United States. According to a Mother Jones article, “Exxon has 20 wholly owned subsidiaries domiciled in the Bahamas, Bermuda and the Cayman Islands that (legally) shelter the cash flow from operations in the likes of Angola, Azerbaijan and Abu Dhabi. Of the $15 billion in income taxes it paid in 2009, Exxon paid none of it to the United States, and it has tens of billions in earnings permanently reinvested overseas.” We should ask why our government is providing subsidies and tax breaks to companies that have little legitimate need for them and apparently little allegiance to the United States. This entry was posted on Wednesday, April 10th, 2013 at 4:58 pm	and is filed under Energy and the Environment. You can follow any responses to this entry through the RSS 2.0 feed. You can leave a response, or trackback from your own site. Really? I’d be curious to know what you find understandable about that. It might be wise to do some reading up on the numbers before citing them. What the IEA estimates are consumption subsidies, estimated by comparing world reference prices with (lower) domestic prices. Most of these types of subsidies are found in developing and emerging countries that are exporters of petroleum or natural gas. How is it that their domestic prices are lower than world-market prices one might ask? Generally through regulations that artificially force the oil and gas companies (almost always state owned) to sell to domestic customers at a lower price than the companies could fetch by exporting the fuel (e.g., Russian gas, Saudi Arabian oil and gas), by export taxes or other restrictions on exports, or by governments directly subsidizing the retail price from their budget (e.g., Indonesia). Fossil-fuel companies are NOT the recipients of these subsidies, except as agents of the government that are required to pass on the subsidies through lower consumer prices. They would earn bigger profits if the consumption subsidies were abolished. There may well be production subsidies benefiting producers in developed and emerging economies, but the IEA does not estimate these. Again, please look at more than the headline numbers. First, these numbers are not generated by the IEA but by the Organisation for Economic Co-operation and Development, the OECD. What we estimate are budgetary support and tax breaks on both the producer and the consumer side. Most of that $58 billion relates to exemptions from or reductions in fuel-excise taxes on fuel used by farmers, fishing vessels, public transport vehicles, and similar off-road or public-sector users. A few billion represent lower value-added taxes on fuels used for heating. And a few more billion are accounted for by programs such as the USA’s Low Income Home Energy Assistance Program (LIHEAP) only around 1/3 of the total represents support on the production side; most of that is in the form of special tax breaks. I appreciate comments from those who have expertise in the area of the article. I think we probably agree on the answer to the question asked in the title, and you certainly do raise some interesting points and added insight. Many developing countries are reluctant to enter into international agreements to limit carbon emissions because they are worried about their own economic development. I think it is understandable that they might wish to subsidize the development of their domestic energy resources, but I would certainly prefer that they subsidize the development of renewable resources. Estimates are that ending fossil fuel subsidies would reduce our greenhouse gas emission by about 10% by 2050, though you may have a better number for that. It does make it clear that just cutting subsidies will not reduce carbon emissions adequately. 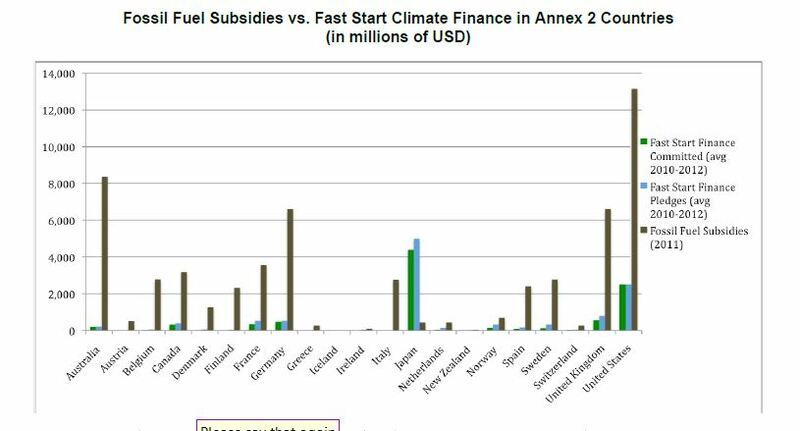 The IEA and the OCD use different methods to arrive at the subsidies to the fossil fuel companies, but I consider both to be estimates as they do not take into account indirect subsidies to the fossil fuel companies. The article used a collection of IEA and OCD numbers to give the reader an idea of how much countries are giving the fossil fuel companies in subsidies. Here’s what the IEA reference said, “Fossil-fuel subsidies are now a growing fiscal burden in many countries, without reforms & if oil prices average $120/bbl, subsidies could top $630 billion this year”. The reference to the subsidies in developed countries listed OECD as one of their sources. I could not find where anyone has addressed the indirect subsidies to the fossil fuel companies, such as uncompensated health care costs caused by emissions or the cost of damage to the environment caused by CO2 emissions. Nicholas Stern touched on part of that when he estimated that the overall costs and risks of climate change is equivalent to losing at least 5% of global GDP each year. Adding in the health cost makes that about $1 trillion just for the United States. Do you have or know of an estimate of subsidies to fossil fuel companies that include indirect subsidies? It is strange that I cannot find your original comment or your name among the registered users, so I’m sorry that I will be unable to help you. Thank you. Yes, you may use ideas from my site, please check the copyright notice for the fair use policy. Thank you. I support fair play in elections as your site does. Good luck to you as well.